Packing school lunches can get expensive, time consuming, and stressful! Pre-made foods like Lunchables are convenient, but they’re also more expensive than homemade options, and they’re loaded with preservatives and other chemicals, making them a pretty poor choice for growing bodies – and your wallet. Learn how to save money, effort, and lots of precious time on this necessary back-to-school chore with these Genius School Lunchbox Hacks sure to make your life – and the school year – so much easier! You or your kids should pack their lunches the night before – or even on Sunday for the whole week. That way, you won’t have to rush as much in the morning! Make a giant batch of PB&J sandwiches ahead of time and freeze them! To serve, just put a frozen sandwich in your kid’s lunchbox, and it’ll thaw in time for lunch! Brown apples are unappetizing, especially for picky eaters, and whole apples can be hard to eat, especially with baby – or missing – teeth. Cut apples for lunch and prevent browning by putting the apple back together and wrapping it with a rubber band or in Saran Wrap! Instead of wasting money on those expensive food packs, buy snacks in bulk and portion them yourself. Make an easy DIY ice pack by freezing juice boxes. Put a frozen juice box in their lunch box to keep food cold and safe until lunch! You can also freeze clean sponges for another frugal ice pack option! Check out this ingenious idea from Tasty Junior. Simplify school lunches by arranging different lunch components ahead of time. Then, let your children pack their own lunches. This teaches your children some responsibility and saves you time throughout the week. A great way to help the kids – and you – pack lunches is to set up a snack station where you can keep all their favorite treats in one place to grab and go. This DIY snack station is awesome, but if you’re not into building projects like this, you don’t need a big setup – a few dedicated plastic containers in the pantry work just fine, too! Prep as much as you can on weekends. Buy groceries, set up lunch stations, cut fruits and vegetables, and prepare other foods like sandwiches and homemade soups, so you don’t have to do as much through the week when it’s even more hectic. Hard-boiled eggs are a cheap, protein-rich meal or snack choice to keep kids full and help them learn with lots of growth and development-supporting nutrients. Cook a bunch of hard-boiled eggs on Sunday or whenever you have some free time. They’ll easily keep in the refrigerator all week. Plus, hard-boiled eggs work double duty, since they can be enjoyed for breakfast, lunch, or both! Heat up their soup in the morning and put it in a handy soup thermos like this, so your kids won’t have to heat it up – and inevitably burn themselves – at school. Plus, they’ll have more time to enjoy their lunch and socialize with friends instead of waiting in line to use the microwave. 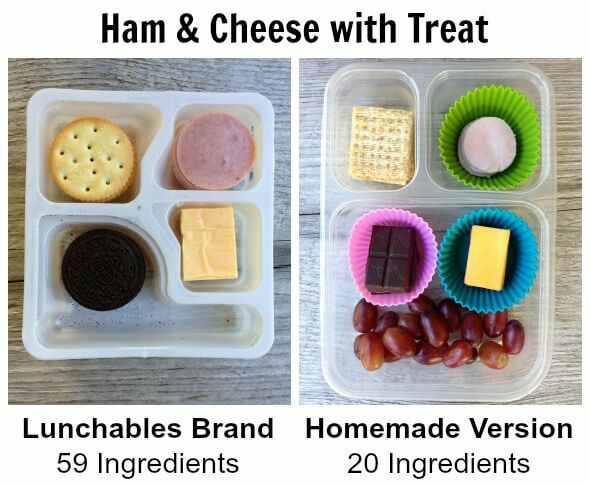 Bento boxes and Divided Storage Containers are great for making your own Lunchables! If your kids are upset that you won’t send them to school with these highly processed and unhealthy meal kits, make your own healthy versions like this DIY pizza lunch kit! Use silicone cupcake liners to make more compartments. Got a picky eater? Make lunchtime more fun – and increase the odds they’ll actually eat it – by cutting sandwiches, cheese, and fruits into fun shapes with cookie cutters. This only takes a few seconds and can have a huge payoff! Make your own healthy squeeze pouches by filling reusable squeeze packages with smoothies, applesauce, or yogurt. Give your kids the satisfying sweet taste of fruit roll-ups without all the chemicals and preservatives with this easy DIY recipe! Keep snacks like chips, crackers, and pretzels from getting crushed by adding some air to the storage bag (blow directly into the bag, or use a straw) before sealing. Check out this free printable. Print it out and put it on the fridge for plenty of healthy and delicious lunch ideas! Preparing your kids for school can be a lot of work, but these Genius School Lunch Hacks are sure to make your life so much easier this school year! I hope these School Lunchbox Hacks help you and your family manage the school year! Please let me know what you think in the comments below!